[SatNews] providing film distributors and advertising agencies in Europe an integrated solution that will guarantee them the reliable delivery of their movies for releases across Europe. 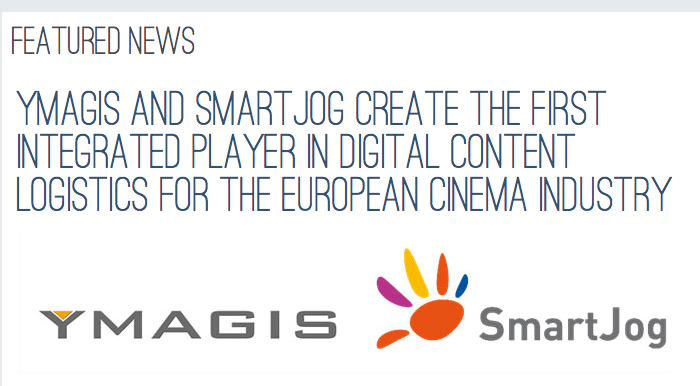 YMAGIS, specialist in digital technologies for the cinema industry, and SMARTJOG, a TDF subsidiary specialized in satellite and ADSL delivery of cinema content, have announced the signature of a binding agreement for the purpose of creating a joint venture which will provide an integrated offer for the physical and digital delivery of digital content to the cinema industry. Creating Europe’s first integrated player, on the eve of the 68th Congress of the National Federation of French Exhibitors, this agreement creates the first European player in digital content logistics for the cinema industry. Indeed, the agreement stipulates that YMAGIS and SMARTJOG will bring to the new entity all of their activities related to duplication and delivery of digital content dedicated to cinema exhibition. Upon completion of this operation, which should occur before December 31, 2013, YMAGIS and SMARTJOG will become shareholders for 60 percent and 40 percent respectively, of the new entity. The new venture will benefit from YMAGIS’s expertise in the duplication and delivery of digital copies (or “DCP”) on behalf of distributors, managed by the Group through its laboratories in Paris, Barcelona and Berlin (from the 4th quarter of 2013). In 2012, YMAGIS duplicated and delivered more than 25,000 movie DCPs (almost 16,500 in the first 2013 half-year alone) and more than 92,000 trailer and advertising DCPs. The new entity will also rely on the communication network implemented by YMAGIS, which now links together the 402 theaters serviced by the Group across Europe. For its part, SMARTJOG provides activities and skills in transporting digital copies by satellite and terrestrial networks that it has developed on a European scale (France, Spain, Portugal, Germany, Austria, Switzerland, Benelux). To date, SMARTJOG has already deployed a network of 1 600 theaters in Europe, representing around 6 000 screens, connected via satellite or terrestrial networks. In this way, SMARTJOG ensured the delivery of 26 000 movie DCPs and 140 000 trailer and advertising DCPs in 2012 across Europe. SMARTJOG also brings developments related to download-on-demand, online archiving and advanced online reporting tools. Together, YMAGIS and SMARTJOG are creating the European leader in this field, which will offer the cinema industry a global logistics service for the delivery of movies, trailers, commercials, alternative content, as well as static or dynamic posters. Its services will cover KDM (1) preparation, and delivery of DCPs and KDMs to cinema screens and laboratories internationally, via satellite, ADSL/fiber or physical media. The close relationships developed by YMAGIS with distributors and exhibitors since its creation and the key position held by SMARTJOG in Europe for digital transmission provide a robust foundation for this new entity’s business development. In particular, this agreement allows the new company to strengthen the services provided to its two shareholders’ existing customers but also to win new customers across Europe. This integrated offer is also a point of entry for commercialization of additional services. Today, distributors are looking for a movie logistics service that takes full advantage of the various models existing in Europe: satellite, terrestrial links (optical fiber or ADSL) and physical devices (hard disk). The full solution offered by YMAGIS and SMARTJOG answers this need for an integrated service at a European level. By managing all distribution channels, the new entity will be able to propose tailor-made solutions to the various players in the market, based on their distribution pattern. From its inception, the company will manage a communication network linking together more than 1 800 theaters in Europe, representing almost 8 000 screens. In order to offer a solution to every theater in France, the new company will provide a reception server, free of charge, to all theaters engaged in continuous activity, thus enabling them to receive digital content (movies, trailers, commercials) via electronic delivery. The goal is to quickly reach maximal coverage in France. In parallel, the new entity will extend its service reach by deploying its network in all Western European countries, and then, at a later stage, in a large part of Eastern Europe, with the aim of completing its network as soon as possible. (1) KDM: Key Delivery Message. The distributor sends an electronic message to the exhibitor, containing the key enabling the digital copy (or DCP) to be played.